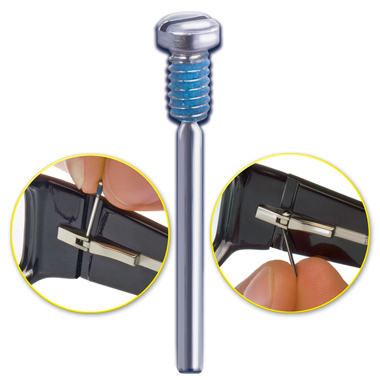 OptiSource International is the exclusive distributor of Snapit™, the revolutionary, patent pending frame screws. These high-quality stainless steel screws have a unique, extra long feeder tab that makes handling screws a cinch and mounting, assembly or repairs a pleasure. After the screw is inserted into any hinge or eyewire the long feeder tab simply snaps off with just your fingers. “Missing frame screws come with the territory of running an eyeglass business”, states Daryl Squicciarini, vice president of OptiSource. “Minuscule screws have always been difficult to handle; and when you add misaligned hinges or imperfect eye-wires, frame repairs become an everyday battle.” Snapit’s feeder tab will align hinges (including spring hinges) and break off cleanly by hand. The screw is left with a smooth finish so the old clipping and filing process is a thing of the past. “Opticians aren’t immune to Presbyopia either”, adds Squicciarini. “Snapit™ makes repairs seem as if they are being done under magnification. Once an ECP uses Snapit™ screws they will never go back to tiny screws.” Snapit™ also makes your screw inventory a breeze, cutting out dozens of repetitive sizes. All Snapit™ screws will self-align, self-tap stripped threads and include the OptiSource Stay-Tight™ thread lock. We look forward to meeting you in person each year at the Vision Expo East and West conferences held in New York and Las Vegas. Let us know how we can serve you better. Click here to go Snapit Screw.